Amazingly fast acting relief from flies and wasps. 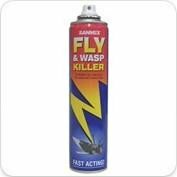 Spray into the air in or around infestations of flying insects. Frequent application may be required in some seasons. Do not use on surfaces which are to be painted. An ozone friendly aerosol spray.